It is believed that thinking for yourself- aloud– is the most courageous act. Often we all get so fed up of the nagging and badgering that we try to find out ways to vent out our frustration. But as the mundane life goes on, the habit of succumbing to the pressures becomes deep-rooted. However, there are still many examples out there in the vast world who have exemplified the idea of ‘living on your own terms’. Revolving around the rebellious and arrant Riya, ‘What Will People Think?’ is the story of every middle-class household where the tradition of curbing the desires of the children persists. Riya is like a free bird who dreams to paint the sky blue with her wings but her family doesn’t approve of her unplanned life. They believe in following the herd- studying engineering, getting a job and then settling in life. When the pot of patience is filled till the brim, Riya explodes metaphorically. Impulsive by nature, she decides to call it quits with her parents and embarks on a journey filled with uncertainties and pocket full of happiness too. 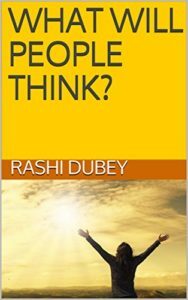 Written using engaging dialogues, ‘What Will People Think?’ breaks the myth that society is the supreme power. It beautifully portrays the angst of a young girl who is always taught to abide by the rules and traditions of the society. Audacious that she is, Riya questions the well-intentioned yet emotionally risky handouts given by the society and faces the consequences too. Even though the plot is clichéd and lacks originality, the topic might intrigue the readers as it is very much relatable. There are punctuation errors that might irk the grammar goblins. The character of Riya lacks depth. I liked Anu per say owing to her nature and her wit. Overall, this is a good and light read. Good effort done by the author!